Deveneys of Dundrum: Aecht Schlenkerla range. 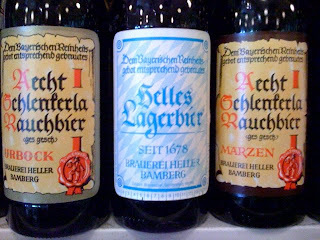 The Brother and Sister of the very famous smoked beer from Bamberg arrived this morning. All 3 available in Deveney's as of today. I've a bit of tasting homework to do tonight and the Lager and Bock are top of my list. I *love* the Helles. It's not made with smoked malt but is just run through the same kit as the beers that are, so it picks up lovely baconey hints. The Urbock is mad: like drinking a freshly tarmacked road, in the nicest possible way. Gonna have to collect some Bock... see how it compares to my homebrew bock. Had to change the line-up for this evening. The lagerbier is up as 1 of the 6.... If you're around, call in. R.